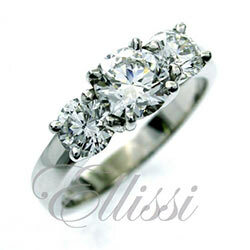 Designing custom made engagement rings can be easy or complex depending on the design in question. Every engagement ring design starts with a fantastic set of diamonds or gemstones. A great, well-cut diamond or sapphire makes the process of ring designing worth the effort. It is important to find the right diamond or main gemstone before we can start to design the ring. This is especially the case with sapphire rings because these gemstones are particularly individual in cut. Do We Need to Draw Every Ring? We don’t always need to do a sketch when making a ring. We can work from photos of a design people have in mind or even a rough drawing on the back of an envelope. When a sketch is needed we draw it by hand in most cases. If you look at the sketches below, you will see that some are pictured with the finished engagement ring on top. This shows just how faithful the finished ring was to the design that was drawn. In some of the designs you can see that the ring is slightly different to the sketch. Ring designing can be a fluid process. This is because as part of the development stage we may decide to it is best to do make the ring in another way. Often a client will ask us for a drawing, but leave some of the detail for us to decide. In these cases, the ring may not replicate the sketch exactly. We draw these sketches in pencil by hand which makes them a little work of art all on their own. We could, of course, use a computer to do this. However, this is just not the same as carefully placing each line on the page to get it right. When I do a sketch, it is like making the ring carefully in my head, thinking it through and working out the best options. Can I Keep the Sketch? Yes, it’s yours if you like. Some of our clients have asked me to sign the sketch of their engagement ring design and then had it framed or laminated as a keepsake. The sketch is a beautiful memento of the process of making a very special engagement ring. It is a nice touch and a one-off original that you can keep forever. Detailed hand made, hand beaded Art Deco Ceylon Sapphire and Diamond Ring. Triple Halo Design With Central “Cushion Brilliant” and Half Moon Diamonds. Emerald Cut Diamond Ring Concept Design, Ready for Construction. Asscher Cut Diamond Engagement Ring With Antique Twin Band and Claw Setting. Cognac Colour Diamond Ring with Octagon Shape Bezel Rim and Halo.